Hey Yo Chico: The death blow, but for who? This is a 3 way matchup, theres only ONE MAN who can walk out on top! Though it was heated between Cyclone and Kevin Devastation, you can’t forget about the EAW Champion who could lose his title without even getting pinned! Stew-O: Well without further adue…. Hey Yo Chico: It’s Kevin Devastation! Going back to his ROOTS! It was one year ago, one year ago that Kevin Devastation was in La Secta Apocalypta! You’ve probably heard it before, he DREAMED of this day! He had VISIONS of this day flashing in his mind AS HE WAS BATTLING ROVIPER! Where Kevin Devastation would be Main Eventing Pain for Pride, he’d make it to the grand stage! And HERE HE IS! Kevin Devastation: LET THERE BE LIGHT!!!!!! ..
Hey Yo Chico: These people are going NUTS! Stew-O: Soldiers Field in Chicago, Illinois is on their feet for this young man! Cyclone has made it SO FAR! He is the classic story of blowing up quick, of following his HEART as soon as he has the opportunity! And though it was at Kevin Devastation’s expense, what a story it would be in the history-books that it would be if Cyclone could walk out of Pain for Pride World Champion! He’d be the YOUNGEST World Champion in history! And he knows as much as these fans know that he can DO IT! Hey Yo Chico: You’re damn right, Stew! I can’t take the suspense, man! I can’t WAIT to see how it goes down!!! ( A Long Silence displays ) …. Announcer: Ladies and Gentlemen, this Main Event Match is scheduled for ONEFALL…. and is a TRIPLE THREAT MATCH, FOR THE E!!!! A!!!! WWWWWWWWWW CHAMPIOOONSHIP!!! Announcer: And FINALLY!!!! …. from JERSEY CITY, NEW JERSEY… WEIGHING IN AT 225 POOOOOOOOOOOOOOOOOOOOOOOOOOOOOOOUNDS….. 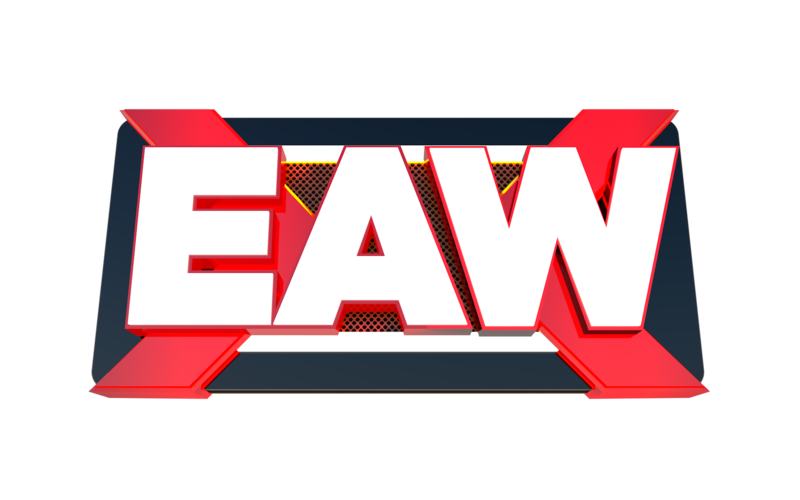 HE IS THE EAW CHAMPIOOOOOOOOOOOOOOON.. EXTTTTTRRRRRRRRRRRREEEEEEEEEEEEEEEEEMEEEEE…. EEEEEEEEEEEEEEEEENIGMAAAAAAAAAAAAAAAAAA!!! Hey Yo Chico: This is the moment… These three guys in a triangle, what happens next?? … These three guys are looking around… and BOTH CYCLONE AND EXTREME ENIGMA ARE TEAMING UP ON THE BIG MAN, KEVIN DEVASTATION! Both guys are pummeling him and ganging up on him with right hands and knee’s into the face and abdomin! As KD is backed in the corner! And Devastation is trapped, is getting hit, but KD with all he’s got SHOVES CYCLONE across the ring to the ground!!! And Kevin Devastation turns towards Extreme Enigma and throws right hands into Enigma’s skull, as Enigma tries fighting back! But its Devastation with the most power in this match, as Enigma is on one knee after 5 or 6 shots! Stew-O: And Enigma delivers a brutal kick to the leg, buying himself some room, as Enigma delivers a baseball-slide into Devastations legs as KD lands on both of his knee’s hard! And from out of NOWHERE Cyclone is back up and KNOCKS DOWN Extreme Enigma with a clothesline! And Enigma gets back up as Cyclone backs Enigma into the ropes, whips him to the other side and as Enigma returns Cyclone connects a QUICK ENZIGURI into the side of the head! As Cyclone hooks both legs! 1!!!!!…………2!!!! !… but a kick out… and Kevin Devastation pulls Cyclone up to his feet… but Cyclone quickly knee’s Devastation in the stomach, and Cyclone delivers a HAND-SPRING enziguri!!! As Cyclone kicks STRAIGHT into the side of KD’s jaw!! And KD falls inbetween the ring-ropes to the outside of the ring!!! And as KD is trying to get up, Extreme Enigma in the ring quickly kicks Cyclone in the gut, and connects a SIT-OUT JAWBREAKER!!! Hey Yo Chico: That was harsh!! Kevin Devastation is groggy and back to his feet holding his jaw… And Cyclone is trying to get himself on all four’s to get up, and as he does Extreme Enigma backs into the ropes, LEAPS onto Cyclone’s back AND SPRINGS HIMSELF OVER THE ROPES TO THE OUTSIDE OF THE RING WITH THE LARIAT ON KEVIN DEVASTATION!!!! Stew-O: NO! NO WAIT!!!! KEVIN CATCHES HIM!!!! KEVIN CATCHES HIM AND HAS HIM IN THE POWERBOMB POSITION!!! AND KEVIN TURNS TOWARDS THE BARRICADE AND HITS THE DIVINE INTERVENTION POWERBOMB!!! AS THE AUDIENCE MEMBERS CLEAR AND ENIGMA CRASHES INTO THOSE CHAIRS!!! Stew-O: Cyclone is heading over to the pedestal, where the EAW Championship is sitting! And Cyclone is… is picking up the EAW Championship and is staring DEAD into the gold! Cyclone is drooling over the shine, the leather, the EAW Championship and all it— WAIT A MINUTE!!! LOOK AT EXTREME ENIGMA, EXTREME ENIGMA IS CLIMBING ONTO THE BARRICADE AND IS NEAR OUR TABLE, AND EXTREME ENIGMA IS RUNNING ON THE BARRICADE AND LEAPS ONTO CYCLONE, WITH THE DIVING CLOTHESLINE SENDING BOTH MEN OVER OUR ANNOUNCE TABLE AND DOWN TO THE FLOOR INFRONT OF THE TABLE!!! Cyclone was just reminded who the EAW Champion is!!! And Kevin Devastation meanwhile rolls back into the ring with a Steel Chair! And now Devastation has the leverage factor, as Extreme Enigma gets up abit slowly, and rolls into the ring now…. but Kevin Devastation is up and is RIGHT THERE!!! Hey Yo Chico: AND DEVASTATION GRABS EXTREME ENIGMA, AND RUNS HIM HEAD FIRST INTO THE TURNBUCKLE, WITH THE STEEL CHAIR EQUIPPED IN IT!!! As he crashes skull-first into the Steel!!! And now Kevin Devastation covers! 1!!!!!……………2!!!!!………….. But Enigma KICKS OUT! This has been quite a struggle for all three men! And Kevin Devastation is now stalking Extreme Enigma as Enigma tries all he can, all he has to get back up to his feet! Enigma is FIGHTING through the pain! But look at this! Cyclone is rolling back into the ring, and HAS A 2×4 IN HIS HANDS!!! HE’S BEHIND DEVASTATION, AND HE IMMEDIATELY CLIPS THE BACK OF KD’S KNEE WITH THE 2×4, SPIKING IT AND SENDING KD DOWN ONE ONE KNEE IN PAIN! And now Cyclone BASHES the 2×4 over the back of Devastation’s skull, as Kevin Devastation is down! And Cyclone hooks the hurt leg! 1!!!!!!……………2!!!!!….. but Kevin Devastation kicks out!!! Stew-O: That’s such a hard thing to do! Kick out using a potentially hurt limb! That clip to the back of the knee will take ANY man down! Now Cyclone rolls back to the outside of the ring…. and Cyclone is looking at the Steel Steps!!!!! He looks at it in a VICIOUS way!!! As Cyclone heads towards them, and pulls them out of place!!! As Cyclone lifts it up using all he’s got, and TOSSES it into the ring!!! Enigma is trying to get up now, and hes barely on his feet using the Turnbuckle as Cyclone rushes back into the ring, and PUMMELS HIM WITH RIGHT HANDS, OVER and OVER into the skull! As Extreme Enigma is in a seated position at the turnbuckle! And now Cyclone places the steps in the middle of the ring… and Cyclone heads towards Kevin Devastation and hammers punches into his face too… until Cyclone pulls Kevin up and PULLS HIM IN!!! AND CYCLONE LIFTS HIM BARELY, CYCLONE IS GOING FOR THE PHENOMENAL CLASH!!!!! MY GOSH!!!!!! Hey Yo Chico: NO!!! KEVIN DEVASTATION WONT LET IT HAPPEN!!! KD REVERSES THE CLASH WITH A BACK-BODY DROP, AS CYCLONE LANDS ON THE STEEL STEPS! The Cold, Sharp and Metal Steps!!! As Cyclone rolls to the corner of the ring and is writhing in pain!!! Kevin Devastation gets back to a tall standpoint now… but EXTREME ENIGMA!!!!! EXTREME ENIGMA IS UP, AND EXTREME ENIGMA KICKS DEVASTATION DIRECTLY IN THE GROIN!!!! AND ENIGMA PULLS HIM IN!!!! AND EXTREME ENIGMA CONNECTS THE TWIST OF FATE!!!!!!!! FACE FIRST INTO THE STEEL STEPS!!!!!!!! AS THE WHOLE ARENA IS SHOCKED!!! AND ENIGMA KICKS THE STEPS OUT OF THE RING, AND PULLS DEVASTATION IN THE MIDDLE OF THE RING TO COVER HIM!!!! THE PIN!!!!! 1!!!!!!!!!!!!!!! !…………… 2!!!!!!!!!!!!!! !……………… BUT DEVASTATION GETS THE SHOULDER UP!!!! JUST A SPLIT SECOND BEFORE THE 3!!! MY GOODNESS!!! Stew-O: THAT WAS CLOSE!!! ITS BEEN A WILD RIDE!!! Extreme Enigma is disappointed, but Cyclone is getting back up now, and he’s stumbling… and Extreme Enigma see’s that and runs infront and UP the turnbuckle INFRONT OF CYCLONE, AND EXTREME ENIGMA DELIVERS THE WHISPER IN THE WIND!!!!! SENDING CYCLONE BACK DOWN, AS IT CONNECTS!!!! BOTH CYCLONE AND KEVIN DEVASTATION ARE LAID OUT! BUT NOW ENIGMA PULLS CYCLONE TO THE MIDDLE OF THE RING! AND EXTREME ENIGMA PULLS OFF HIS SLEEVELESS TEE, AND TOSSES IT INTO THE CROWD! AND EXTREME ENIGMA HEADS ONTO THE APRON, AND IS CLIMBING THAT TURNBUCKLE!!!! THE ENTIRE ARENA IS ON THEIR FEET, EXTREME ENIGMA IS CLIMBING ALL THE WAY TO THE TOP!!!! KEVIN DEVASTATION IS DOWN AND OUTSIDE OF THE RING!!!! EXTREME ENIGMA LETS OUT THE LOUDEST, LARGEST YELL INTO THE NIGHT!!! INTO THE CITY OF CHICAGO!!! INTO THE ENTIRE WORLD, FOR THE ENTIRE WORLD TO HEAR!!!!! AND EXTREME ENIGMA LEAPS OFF AND CONNECTS THE SWANTON BOMB!!!!!!!!!! THE SWANTON BOMB!!!!!!!!!!!!!! MY GOD ITS OVER!!!!!!!! Hey Yo Chico: NOOOOOOOO!!!!!! NO!!!!!! CYCLONE LIFTS HIS KNEES!!!!! CYCLONE LIFTS HIS KNEE’S!!!!! AS EXTREME ENIGMA CONNECTS SPINEFIRST INTO CYCLONE’S KNEES!!!!!!!!!!! THAT WAS ALL! OR! NOTHING!!!!!! AND SOMEHOW, CYCLONE AT THE FINAL SECOND REACTED!!!! MY GOD!!!! AND NOW CYCLONE IS MUSTERING IT ALL UP, CYCLONE IS GETTING BACK TO HIS FEET…. BUT AS HE GETS UP, KEVIN DEVASTATION SLIDES INTO THE RING, AND AS CYCLONE TURNS AROUND KEVIN DEVASTATION CONNECTS THE BIG BOOT!!!!!! STRAIGHT INTO CYCLONES FACE!!!!!! AS CYCLONE IS OUT!!! AND KEVIN DEVASTATION COVERS!!!! 1!!!!!!!!!!!!…………..2!!!!!!!………. BUT CYCLONE KICKS OUT!!!!! WHAT A RUSH!!!!!! WHAT A MATCH!!!!! AND KEVIN DEVASTATION IS ENRAGED, HIS FACE IS LITERALLY TURNING RED!!! HIS EYES ARE BULGING!!!! AND KEVIN DEVASTATION LIFTS CYCLONE UP TO HIS FEET!!!! AND KEVIN DEVASTATION PULLS HIM IN, AND UNDERHOOKS HIM!!!! HE’S GOING FOR THE WRATH OF OLYMPUS!!! THE DOUBLE UNDERHOOK PILEDRIVER!!!! Stew-O: WE HAVEN’T SEEN THIS SINCE PAIN FOR PRIDE 2!!!! HE’S GOT I— NO!!! FROM BEHIND!!! ITS EXTREME ENIGMA!!! EXTREME ENIGMA WITH THE STEEL CHAIR, AS HE BASHES IT STRAIGHT INTO KEVIN DEVASTATION’S SPINE!!!! AND EXTREME ENIGMA HIS KD OVER, AND OVER, AND OVER AGAIN UNTIL IT’S TENTED AND TWISTED, AS KD LETS OUT CRIES OF PAIN, AND IS DOWN!!!! AND EXTREME ENIGMA FALLS BACK TO HIS KNEES, HIS BACK IS IN PAIN!!! He’s an inch away from being PARALYZED! And Cyclone is standing over Extreme Enigma… and PULLS THE STEEL CHAIR OUT OF ENIGMA’S HANDS!!! And Extreme Enigma is trying to use Cyclone to get back up to his feet!!!! As Cyclone stands there watching! And Enigma SMACKS CYCLONE CLEAN ACROSS THE FACE!!!!! AND CYCLONE TURNS AROUND, AND BASHES EXTREME ENIGMA IN THE SKULL WITH THE HARDEST CHAIRSHOT I’VE SEEN IN A LONG TIME!!!! Hey Yo Chico: AND EXTREME ENIGMA IS BUSTED OPEN! HES ON HIS BACK! HES OUT!!!! AS CYCLONE COVERS!!!!!! NEW CHAMP!!!!! NEW CHAMP!!!!! 1!!!!!!!!!!…………….2!!!!!! !………… BUT EXTREME ENIGMA GETS THE ARM UP!!!!!!!!!! MY GOD!!!! IS THIS EVER GONNA END!?!?!?! ARE THESE MEN EVER GONNA GIVE UP!!?!?!??! NOW CYCLONE IS SCREAMING!!! SCREAMING OFF OF RAGE!!! OFF OF DISBELIEF!!! HE IS JUST SHOCKED!!! AND CYCLONE PULLS THE LIFELESS ENIGMA UP… PULLS HIM IN… AND CYCLONE QUICKLY CONNECTS THE PHNEOMENAL CLASH! Hey Yo Chico: WE’VE GOT A NEW EAW CHAMPION!!!!!!!!!!!!!! Stew-O: THIS IS A DREAM COME TRUE!!!!! A CINDERELLA STORY COME TRUE!!!!! FROM THE BOTTOM, THE ABSOLUTE BOTTOM OF THE BARREL TO A RISE IN SEVEN MONTHS!!!! CYCLONE IS ON THE TOP OF THE WORLD RIGHT NOW!!! HE IS ON TOP OF THE WORLD!!!!! Hey Yo Chico: It’s a real Cinderella type story!!! Cyclone was at points where motivation was at a low! Cyclone was in and out of zone, NO ONE saw in Cyclone the potential, NOT EVEN KEVIN DEVASTATION! KEVIN DEVASTATION NEVER EXPECTED CYCLONE TO BE HERE, AND HE TOOK HIM UNDER HIS WING! NONE OF US DID! CYCLONE HAS BECOME THE YOUNGEST EAW CHAMPION IN HISTORY, CYCLONE HAS BECOME THE FASTEST RISING SUPERSTAR IN HISTORY!!! CON-GRATS!!! Stew-O: The end of a HISTORIC Show!!! All 3 of these men fought their HEARTS OUT! They were willing to give their LIVES for this! Willing to give EVERYTHING for this!!! But Cyclone has officially MADE IT!!! !